Pre-eminent among European political philosophers, Norberto Bobbio has throughout his career turned to the political theory of Thomas Hobbes. Gathered here for the first time are the most important of his essays which together provide both a valuable introduction to Hobbes's thought and a fresh understanding of Hobbes's place in the theory of modern politics. 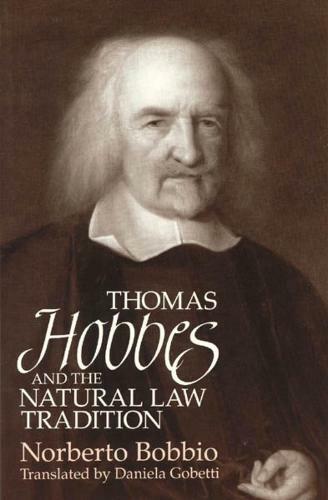 Tracing Hobbes's work through De Cive and Leviathan, Bobbio identifies the philosopher's relation to the tradition of natural law. That Hobbes must now be understood in both this tradition as well as in the seemingly contradictory positivist tradition becomes clear for the first time in Bobbio's account. Bobbio also demonstrates that Hobbes cannot be easily labelled "liberal" or "totalitarian"; in Bobbio's provocative analysis of Hobbes's justification of the state, Hobbes emerges as a true conservative. Though his primary concern is to reconstruct the inner logic of Hobbes's thought, Bobbio is also attentive to the philosopher's biography and weaves into his analysis details of Hobbes's life and world--his exile in France, his relation with the Mersenne circle, his disputes with Anglican bishops, and accusations of heresy leveled against him. The result is a revealing, thoroughly new portrait of the first theorist of the modern state.